The seal of the State Department is seen on the podium as Secretary of State Mike Pompeo makes a statement about refugees to the media, Sept. 17, 2018, at the State Department in Washington. "Gutted"…. "Empty"— words critics for months have used to characterize the U.S. State Department as a place where many vacancies for senior positions were left unfilled and morale was badly bruised. U.S. Secretary of State Mike Pompeo is pushing to bring the momentum back to the department and says he is actively working to restore the morale of American diplomats. "I know that American diplomacy is most agile and most effective when we have our entire team in place. We need to have that senior leadership team empowered," Pompeo told reporters at the State Department on September 14. The pace of staffing senior positions at State has largely increased. According to the American Foreign Service Association (AFSA), 20 ambassadorial nominations (including senior positions representing the U.S. to the United Nations) have been confirmed over a four-month period after Pompeo started the position as the chief U.S. diplomat, following the firing of former Secretary of State Rex Tillerson. In comparison, 52 ambassadorial nominations were confirmed between January 20, 2017 and April 25, 2018. AFSA is both a professional association and an exclusive representative for the U.S. Foreign Service. Last Thursday, four career diplomats were conferred as career ambassador, one of the highest and most prestigious ranks in the foreign service, after their nominations were confirmed by the Senate. Those confirmed include Under Secretary for Political Affairs David Hale, U.S. Ambassador to Haiti Michele Sison, Assistant Secretary for the Bureau of Intelligence and Research Daniel Smith, and Charge d' Affaires of the U.S. Embassy in Havana Philip Goldberg. The confirmations are seen as the latest sign that Pompeo is strengthening the department's leadership, where many top positions were left unfilled for more than a year before he took office in late April. 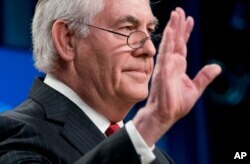 FILE - Secretary of State Rex Tillerson waves goodbye at the State Department in Washington, March 13, 2018, after his firing earlier in the day. President Donald Trump said he would nominate CIA Director Mike Pompeo as the top U.S. diplomat. Diplomatic sources said more significant than the supposedly higher promotion rates is the lifting of self-imposed restrictions put in place last year by Tillerson on the State Department's footprint at the opening of the United Nations General Assembly (UNGA) in New York. Tillerson explicitly sought to limit the number of U.S. diplomats who were in New York for UNGA. But a current diplomat said under Pompeo, it appears there will be robust working-level engagement by State Department officials with their foreign counterparts. The diplomat added that it is a "recognition of the valuable work being done by career diplomats." Tillerson was under fire for not filling many vacancies of senior positions and slashing the budget of the State Department, bringing down the morale of the diplomatic workforce. "Pompeo certainly is trying to undo some of the wreckage of Tillerson's management," Laura Kennedy, former deputy assistant secretary for European and Eurasian affairs, told VOA. "He also benefits enormously from having a good relationship with President Donald Trump and from being more closely aligned with Trump on policy grounds,"
Still, Kennedy said she is troubled by "the apparently deliberate policy" of excluding career foreign service officers from nomination to the ranks of the assistant secretaries who "pretty much run the building."